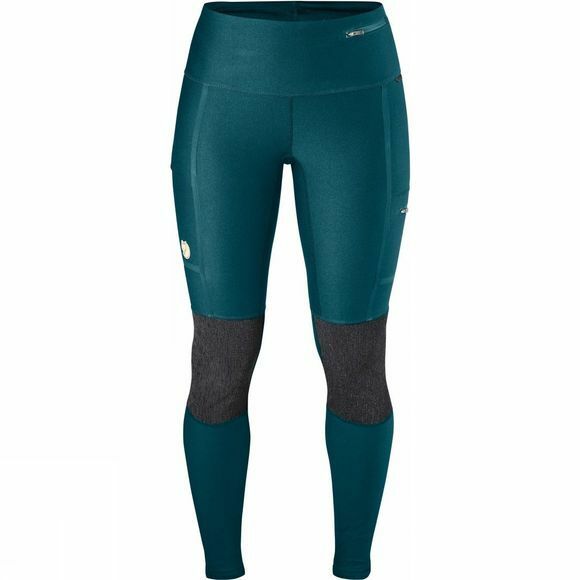 The Women's Abisko Trekking Tights from Fjӓllrӓven are perfect for faster treks as well as more relaxed ones in mountain terrain. They have been made with exceptionally durable fabric that is comfortable next to the skin along with a gusseted crotch and low profile seams to minimise the risk of chafing. A wide set, high waist band is comfortable and flattering and features a drawcord to secure them in place. A zipped security pocket sits at the waistband while another zipped pocket sits on the left thigh while a map pocket sits on the right thigh, ideal for keeping essentials to hand while you are on the move. Extra reinforcement at the knees and rear is great for durability and will make a huge difference when you stop to catch a breath and soak up the view.